Active patients who suffer with hip arthritis may well benefit from the Birmingham Hip Resurfacing (BHR) procedure, a bone-conserving alternative to Total Hip Replacement arthroplasty. Pioneered by Derek McMinn, the Birmingham Hip Resurfacing restores the natural shape of the joint meaning better stability, longevity and higher levels of patient activity than a traditional hip replacement. The Birmingham Hip Resurfacing has enabled thousands of patients - including many high profile athletes - to leave behind the pain and immobility of an arthritic hip, restoring their quality of life. With Total Hip Replacements, the femoral head (ball joint of the hip) is removed and replaced by a long, stemmed device. Very little of the femur is retained - as shown in the diagram below. The procedure is reasonably successful in elderly, relatively inactive patients. However, replacement hip joints wear out quickly in younger, more active patients, leading to the inevitable saga of revision surgery and associated complications. With the BHR procedure, however, Mr McMinn removes just a few millimetres from the two articulating surfaces of the hip. The procedure is bone-conserving because most of the joint is retained (see diagram). The femoral head is shaped to accept a low-wear metal sphere. This sphere matches the patient's anatomy, meaning there is a low risk of dislocation, a broad range of movement and excellent stability. The acetabular socket (cup joint of the hip) is then fitted with a corresponding metal cup. Since the metal femoral component articulates within a metal acetabular cup, the BHR is referred to as a Metal-on-Metal (MoM) hip joint. A comprehensive range of sizes is offered to address the needs of most patients, even those with acetabular deficiencies. 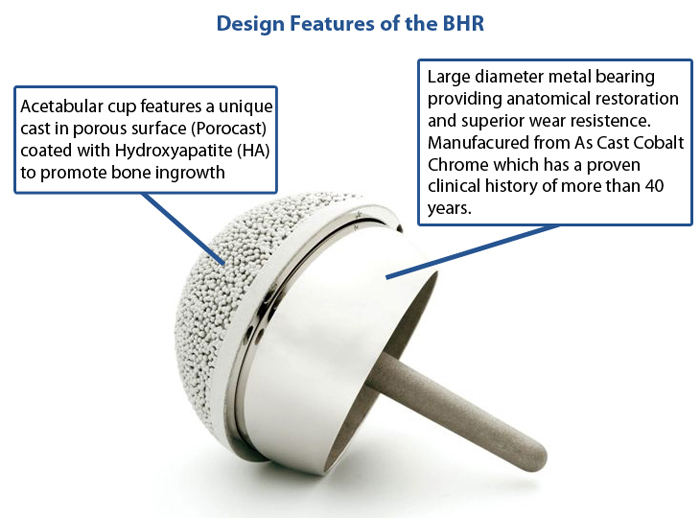 The Birmingham Hip Resurfacing is manufactured from as-cast Cobalt Chrome, which has a proven clinical history of over 40 years. 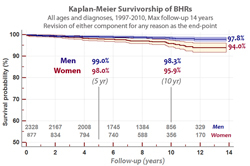 The BHR's unique design remains unchanged in its 14 years of clinical use. The BHR is also the world’s most successful MoM hip resurfacing system with over 140,000 implantations globally. The BHR was approved by the FDA for clinical use in the US in May 2006. 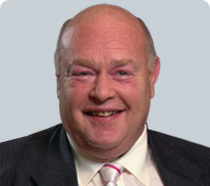 Mr McMinn is one of the leading experts in conservative joint replacement. He has outstanding success rates with the BHR procedure - please see the Results tab for more information. Having performed over 3,500 MoM Hip Resurfacings over the course of 20 years, he is also one of the most experienced surgeons working in the field. Who better to perform your BHR than the man referred to as the ‘Father of Modern Hip Resurfacing’? To book a consultation with Mr McMinn please click here for more information. To see how patients recover following BHR surgery, please click here for a video case study. Mr McMinn recently recorded a video lecture called 'BHR & Other Options' - The lecture is a comprehensive overview of the current status and future of hip resurfacing. Watch the lecture here. 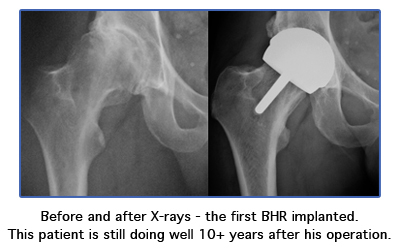 Mr McMinn has performed 3205 Birmingham Hip Resurfacings (BHRs) between July 1997 and December 2010. These include 2328 men and 877 women; the average age at operation was 53 years. Of these 3205 BHRs, 70 have been revised to a total hip replacement at various stages of follow-up. Reasons for revision include fracture through the femoral neck and collapse of the femoral head. Following their revision surgery, these patients are functioning well. 70 revisions out of 3205 BHRs gives a failure rate of 2.2%. 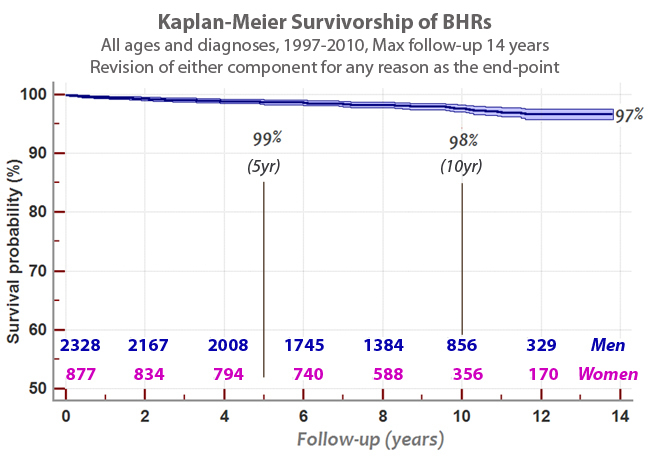 If all these 3205 were to reach 14 years follow-up, the failure rate is predicted to be 3% (97% success rate) as shown in survivorship graph A below. If we break these figures into results for male and female patients, there have been 35 revisions in men and 35 revisions in women. 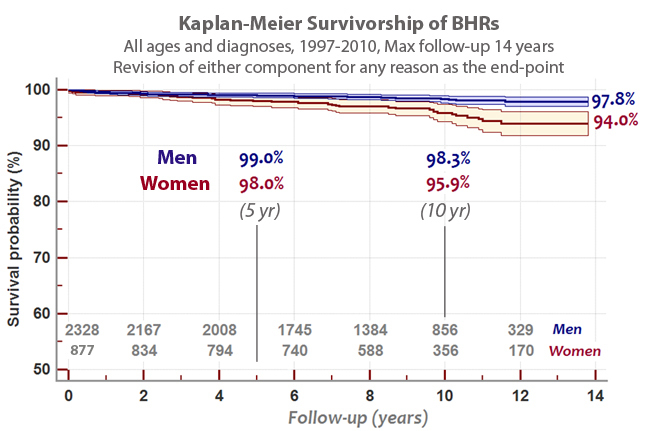 If all 2328 men and 877 women were to reach 14 years follow-up, the failure rate is predicted to be 2.2% (97.8% success rate) and 6% (94% success rate) respectively as shown in survivorship graph B below. Daniel J, Ziaee H, Kamali A, Pradhan C, Band T, McMinn DJW. 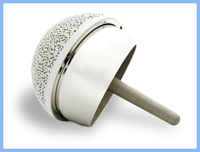 From 1997, Mr McMinn carried out the first 500 Birmingham Hip Resurfacings (BHRs). 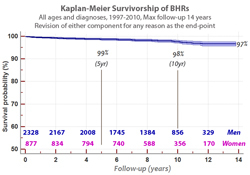 The blue line on graph C below shows a 92.5% implant survival at seventeen years for Mr McMinn’s first 500 Birmingham Hip Resurfacings. 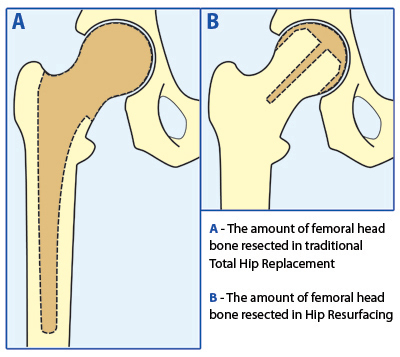 Incorporating the previous 500 metal-on-metal resurfacings undertaken between 1991 and 1997, the blue line is effectively the result of a total of one thousand Hip Resurfacings. The green line in graph D below shows the results of an additional 3136 procedures carried out by Mr McMinn up to July 2014. The implant survival of these procedures is significantly better at 97.9%, a five percent improvement in results at fifteen years. This shows that there is a clear learning curve for Hip Resurfacings and that learning curve is one thousand cases.